This article reviews the supplement Dr. Whitetaker Focal Point. The purpose of this product is to promote quick thinking, quick learning, as well as focused recall. It also contributes to improved overall mental performance. You will gain more insight into this product as you continue to read this review. Bacopa extract (320mg)– has numerous benefits associated with cognitive function, attention, and memory. It can improve working memory, precision, the capacity to process visual information, and the capacity to retain information. American Ginseng (200mg)- improves memory and increases attention. Vitamin B6 (30mg)- influences the release of attitude and motivation neurotransmitters. It also promotes neural and cognitive functions, as well as the proper transmission of brain nerve impulses. Vitamin B12 (500mg)- assists in the proper functioning of the nervous system and the brain. One bottle of Focal Point contains sixty capsules. According to the doctor’s prescription, users should take two capsules once per day. Therefore, one bottle should last for 30 days. This product is definitely not for children and should be kept out of their reach. There is no clear information about what the possible side effects of taking Focal Point might be. The lack of such information may cause users to worry about what negative effects to expect. Nevertheless, it is recommended that pregnant and breastfeeding women should not use this product without professional advice from health care practitioners. One bottle of Focal Point costs $31.49, which is a discounted price. Users who buy three bottles at once receive one free bottle and pay $94.47 for the package. A purchase of five bottles attracts two free bottles and the package costs $157.46. These prices are relatively fair and consumers have the power to choose the package that best suits their pocket. The manufacturer promises a 100 percent money-back guarantee. In case Focus Point fails to meet the expectations of users, users can return the product within ninety days and receive the amount they paid for the product in full. According to the number of customer reviews, the average rating is 3.8 out of 5. This rating is not bad, but a higher rating would definitely increase the trust of consumers who wish to buy this product. Focal Point is a recommendable product for people who want to improve their thinking, learning, recall, and mental performance. Apart from the purported health benefits, this product contains trusted ingredients and offers a satisfaction guarantee, which is a vital piece of information for consumers to know before purchasing the product. Furthermore, consumers have the freedom to choose a package that they can afford in order to enjoy discounts. However, the product contains few ingredients compared with other products. Furthermore, it does not provide adequate information about the possible side effects for users apart from a warning targeting children and pregnant women. Therefore, potential buyers who may raise questions about the unknown negative side of the product. 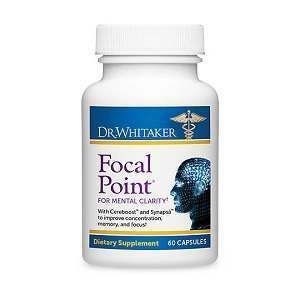 Henry Costa	reviewed Dr. Whitetaker Focal Point	on June 14th	 and gave it a rating of 4.